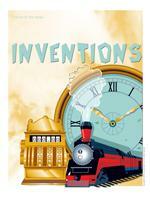 Many great inventions inspired this theme's crafts, games, and activities. From telephones to robots, there is something for everyone! Play a few rounds of the telephone game at the start of each day. The telephone is an exceptional invention! Have children sit in a circle. Ask one child to pick a word or expression and have him whisper it into the ear of the child sitting to his right. This child must then whisper the word to the child sitting to his right, and so on, until the word has travelled all the way around the circle. Invite the last child to say the word or expression out loud. Verify if the word or expression corresponds to what the first child had said. A camera, costumes, masks, glasses, scarves, hats, boas, a mirror, empty makeup containers, various accessories, a veil, etc. Books, stickers, boxes, pens, a ruler, index cards, stamp pads, bags, cardboard, etc. Envelopes, stickers to represent stamps, boxes, wrapping paper, pens, a ruler, index cards, stamps pads, bags, cardboard, mail bags, etc. Different sizes of paintbrushes, rollers, bowls, wooden sticks, trays, aprons, ribbon, hats, color samples, tools, blocks, etc. Telephones, cell phones, notepads, pens, intercom, answering machines, headphones, etc. The pictures may be used as a memory game or to spark a conversation with the group. Use them to decorate the daycare or a specific corner. (Open picture game - Inventions) Print, laminate, and store in a Ziploc bag or in your thematic bins. 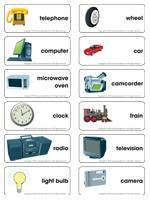 (Open writing activities - I for Inventions) Print for each child or laminate for use with a dry-erase marker. Invite children to create an invention of their own using blocks and explain its functions. Add empty cardboard tubes, drinking straws, and a variety of recycled materials to your area to spark children's creativity. Invent your own time travel machine. Kleenex boxes, recycled containers of all kinds, yarn, string, ribbon, etc. Children can use the material to create unique inventions (individually or as a group). Construction paper which can be cut and glued to represent various inventions mentioned within the theme. Cardboard boxes which may be used to create microwave ovens or televisions. Various shapes drawn on paper which can be cut out and used to create different inventions. Using poster paint, make round stamps, like a wheel. Coloring pages which represent various inventions which children may already know. If not, they will discover them for the first time! Creative coloring, children draw what they see on their television screen. Paper with circles, squares, and triangles drawn on it. Children can invent whatever they want! Roll small cars in poster paint and observe the marks on the paper. Musical drawing: Draw circles, circles, and more circles to the sound of music. o Microphone, director's chair, headphones, console with plenty of buttons to press, various radios, etc. o Desk and chair, keyboard, mouse, screen, joystick, etc. o Kitchen utensils and bowls, table, chairs, dishes, plastic food items, microwave oven and stove, etc. o Backdrop, old cameras, accessories, digital camera to take pictures of your group! See the "Area setup" section of the theme for other great ideas. Memory game related to various inventions using the educatall.com picture game. Round containers and objects which can be used for a discussion about how the wheel was invented. Games which can be used to teach children how to tell time. Children can invent stories using the illustrations in the educatall.com picture game. A large sheet of white paper hung on the wall. Children can create their own invention story throughout the theme. Children can watch a movie on television or listen to a story on the radio. 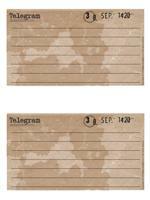 Laminated drawings. Children can trace the lines using a dry-erase marker. An obstacle course which uses various motor skills. Blow on empty toilet paper rolls using drinking straws to make them roll. Children can roll a hula hoop as far as they can. Children can roll a ball under their hand, on the ground, under their foot, under their chin, etc. Move about like a car or a train. Magic nuudles for creating colourful inventions! Invent a recipe using several different ingredients! Sit in a circle with your group. The first child must select a word and whisper it into the ear of the child sitting to his right. This child must then repeat the word in the ear of the child sitting to his right, and so on, until the word has travelled all the way around the circle. The last child to hear the word must say it out loud. Check to see if it is the word which was spoken by the first child or not. Start over, giving another child the chance to begin. (Open I know my phone number game) Print, laminate, and cut out. Using Velcro, children must add the numbers which make up their home telephone number. Children must leave the room. Hide a cordless telephone within the daycare. Press the page button. When the telephone rings, children must search for it. 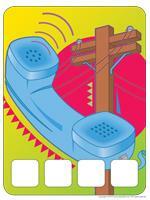 To make the game more difficult, use several telephones and program a different ring tone for each one. Take a walk with your group and show children a public telephone. Show them how we must drop coins into the slots in order to make a phone call, except to dial 911.Show them how to dial 911 and explain how this number must be taken seriously. Have each child surprise their parents with a phone call (or a message on the answering machine). Use two metal cans of the same size per child (make sure the edges are not sharp). Make a small hole in the bottom of each can (using a hammer and nail). Thread a piece of string through the hole and make a knot inside each of the cans. Have children decorate the cans using tissue paper, stickers, wallpaper, etc. Be sure to leave enough room to add a keypad (use number stickers purchased at the dollar store). Children can talk to each other. Children take turns playing the role of the cameraman. The other children dress up and pretend to put makeup on. They can act out various scenes while the cameraman pretends to film them. Use your camcorder to film children throughout the day while they are having fun. You may even film them during naptime to surprise them. At the end of the day, watch your movie! Play the silence game. When you give the signal, everyone must stop talking. The game ends once all the players have spoken. Encourage children to look each other in the eye. This game is very useful when you need your group to calm down. Use an empty tissue box. Make a hole in the box so that you can see through it. Cover the box with aluminum paper. Children will love pretending to film themselves throughout the day! Prepare a news segment with your group. Add interviews about the day's menu or about various activities. Record your news segment and listen to it on a portable radio. Use blankets to build your own radio station. Hang posters of pop stars. Let children spend time in their radio station. They can read books or magazines. Set up a tape recorder so they can record themselves. Cover an empty toilet paper roll with aluminum paper. Apply white glue to a Styrofoam ball and roll it in a plate filled with glitter. Insert the ball in the end of the cardboard tube. Children can use it for pretend interviews. Play music throughout the day. Whenever a good song is playing on the radio, turn up the volume and invite children to dance with you. Give each child a flashlight. Turn the lights off and close the curtains to make the daycare as dark as possible. Children will enjoy walking around the daycare, observing objects with their flashlight. Light, what a brilliant invention! Stick glow in the dark stars under a table. Add blankets on top to create a little hideout. Invite children to crawl under the blanket to discover the surprise. You can also glue illustrations under the table. They will not glow in the dark but children can use a flashlight to discover them. Turn all the lights off and unplug any appliances which you use daily. Encourage children to try certain activities which require electricity such as playing with a Lite-Brite game, watching a movie, etc. Children will quickly realize how important this invention really is. Angelique Boissoneault suggests various activities to introduce children to science with her friend Globule. To try other experiments visit http://www.educatall.com/Science-corner.html. Ask children if they know what static electricity or "static" is. Ask them to name situations in which they observed static. For example, they may say clothes coming out of the dryer, lightning during a thunderstorm, tiny shocks we feel when we touch a friend, etc. 1. Place confetti on a non-metallic surface. A wooden or plastic table is best. 2. Comb your hair (which must be dry) for approximately 2 minutes. 3. Place the comb near the confetti. 5. Have your daycare worker help you blow up your balloon and tie a knot. 6. Rub your balloon vigorously with your piece of felt. 7. Place the part of the balloon you rubbed with felt against the wall and let go. It sticks like magic! 8. You can try rubbing the balloon in your hair too. When you rub a plastic object, you charge it with electricity. This charge creates an attraction between an object (the comb or the balloon) and another object which is not charged (confetti or wall). The attraction lasts for a certain period of time after which the object gradually loses its charge and falls to the ground. Electrical discharge occurs when objects lose their charge too rapidly. This produces a tiny spark or shock. When the charge is greater, the discharge may cause a luminous flash of light. This is what happens during a thunderstorm. Children take turns pretending they are photographers. The other children dress up and pretend to apply makeup. They can pose for the photographer in various ways. When they have all had a turn, the photographer can draw his favourite pose. It's your turn to be the photographer! Take a few pictures of each child. Use the pictures to create a photo album which shows the children's daycare routine. Arrange four separate areas within your daycare using rope or hula hoops. The four corners will represent trains. Children become passengers. The leader will be the train conductor. When you give the signal, the conductor must say, "Passengers, change trains!" Children then run towards another train (corner). During this change, the conductor must attempt to catch the passengers (children). Each passenger who is caught becomes a train conductor too. The game ends when there are no more passengers to catch. Children stand single file, holding the waist of the child in front of them to form a train. The train leaves to visit different inventions. Announce your departure and encourage children to make "train-like" sounds. Every now and then, invite children to get off the train to visit inventions. Ask children questions at each stop. Let children play with material related to each invention before leaving for the next station. Collect boxes of all kinds. Have children decorate them. Tie them together using ribbon. Children will enjoy pulling their train around the daycare. Have each child prepare a letter and mail them to the daycare. After a few days, show children that the letters arrived at your local post office (or in your mailbox). Why not surprise parents by mailing one of their child's drawings to their home? (Open telegram) Print for each child. Ask children to write various codes. When they are done, they can read their telegrams to their friends. After each word, they must pause and say "STOP". Set up an internal postal service within your daycare. Help children make their own mailbox. It can be as simple as a decorated tissue box. Next, encourage them to deposit drawings they have made for their friends inside. During circle time, distribute the mail. Make sure there is mail for everyone. Parents can participate too! Visit your local post office with your group. If you call ahead of time, postal workers will most likely be more than happy to show you around, let children look at different types of stamps, and explain how postal services work. (Open game-clock) Print, laminate, and cut the pieces. Children assemble the clock pieces while sitting on the floor. (Open I'm learning to tell time) Print, laminate, and assemble the clock. Place the cards showing different times face down on the table. Children pick a card and adjust the hands to the correct time. Children sit in a circle. To the sound of music, have them pass a clock around the circle. Make sure the hands can be moved easily. 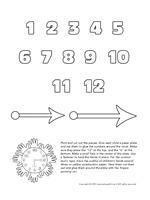 When the music stops, ask children to place the hour or minute hand so that it is pointing to a specific number. (Open sun clock) Print and cut out the pieces. Give each child a paper plate and ask them to glue the numbers around the clock. Make sure they place the "12" at the top, and the "6" at the bottom. Make a small hole in the center of the plate. Use a fastener to hold the hands in place. For the contour (sun's rays), trace the outline of children's hands several times on yellow construction paper. Have them cut them out and glue them around the plate with the fingers pointing out. The robot, what an invention! (Open game-Giant robot pieces) Print, laminate, and cut out the pieces. Children sit on the floor and work together to assemble the robot. Provide metal cans, empty toilet paper rolls, aluminum paper, and other recycled materials. Children can use the material to create a robot. Help them stick the pieces together using hot glue. Give each child a brown paper bag. Cut out the eyes, a nose, and a mouth. Provide metal cans, empty toilet paper rolls, aluminum paper, and other recycled materials children can use to create a robot. Help them stick the items to the paper bag with hot glue. (Open coded message) Print. Robots have a unique language which we do not understand. Use the coded messages and ask children to invent a meaning for them. Deposit four hula hoops on the floor, next to each other. Children stand in a circle around the hula hoops. Taking turns, they must hop in the hula hoops to the sound of music. When the music stops, the child who is standing in a hula hoop must name an invention. If he succeeds, he can continue the game, if not, he must remain in the hula hoop until another child misses. Children find a partner. They stand at opposite ends of the daycare and roll a ball back and forth. Place a sheet of paper in the bottom of a box. Add small cars and drops of paint. Tip the box from side to side to make the cars roll around. Admire the streets the wheels create. Organize an activity to help children understand the importance of wheels. Have them carry several items, such as heavy toy chests, large boxes, etc. Time them to see how long it takes them to move them from one point to another. When they are done, provide a small wagon to help them transport the items back to the starting point. Ask them which method was easier and/or faster. Provide small cars, trucks, balls, marbles, etc. Experiment with your group to discover how fast the items roll. Create a slope and draw a line in the center. Count backwards and watch to see which object wins. (Open magnifying glass game-Inventions) Print. Laminate the board game and the cards. Cut them out and store them in a box or plastic bag. Children pick a card and search for the item on the board game, using a magnifying glass. Once they have found the item, they deposit the card in the correct square, on the board game. (Open association game-Inventions) Print and laminate the game. Using Velcro, children must associate the cards to the correct inventions. (Open creative coloring-Inventions) Print for each child. Ask children to draw an invention in the light bulb. (Open coloring pages theme-Inventions) Print for each child.